WI 2013 | ERCIS Competence Center "Service Science"
The International Conference on Wirtschaftsinformatik is the most prominent German Conference on Information Systems that is held bi-annually in all odd years. 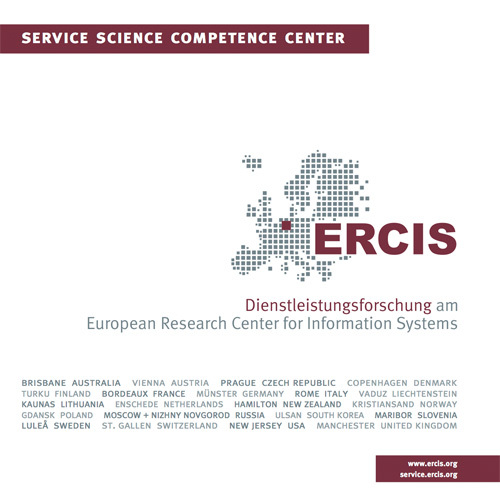 The ERCIS Service Science Competence Center was involved at Wi2013 by hosting the track on "Business Process and Service Management" (http://www.wi2013.de/199.0.html?&L=1). The track was chaired by Jörg Becker (WWU Münster) and Jan Mendling (TU Vienna). Daniel Beverungen was involved as an associate editor.